Perhaps the most obvious form of syncretism in my own practice is Honji Suijaku, or the merging of Shinto with Buddhism. 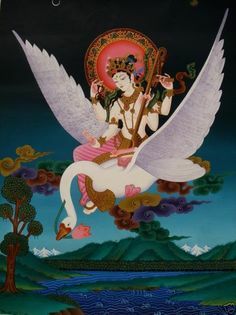 Benzaiten-sama was the Indian goddess Sarasvati, but was absorbed into the Japanese pantheon after becoming associated with the goddess Ichikishima-hima. She was eventually so thoroughly nativized that she was again syncretized with a Buddhist figure – this time Kannon, better known as Guanyin. Syncretism is when you combine two things together to create a new thing, and it’s very common in many religions. It happens both historically and in modern times, for a variety of reasons. I’ll start by discussing historical examples, and will cover ways to approach syncretism yourself in another post. Syncretism in the Roman Empire– We’ll Go to War with You and Then Add your Gods to Our Pantheon! Posted on May 17, 2015 June 21, 2015 by Redfaery	This entry was posted in Gleanings and tagged Benzaiten, Buddhism, Guanyin, Kannon, Sarasvati, Shinto, syncretism. Bookmark the permalink.